A nice evening conjunction of the moon and Comet PanSTARRS, with the requisite saguaro silhouettes in the foreground. And a bonus owl silhouette on the cactus at the far left. I didn't see him until I looked at the images on a computer screen. You can see his pointy little ears in the full res version. I would guess he was looking for dinner, not looking at the comet. Taken 12 March 2013, from Sabino Canyon in Tucson, AZ. Canon Rebel T3i, 55-250mm lens at 130mm f/11, ISO1600, 2-sec exposure. Camera: Canon EOS 60Da, Lens	EF-S18-135mm f/3.5-5.6 IS at 128mm, F/5.6, ISO 1600, 2-sec Exposure. Last edited by bystander on Wed Mar 13, 2013 5:57 am, edited 2 times in total. 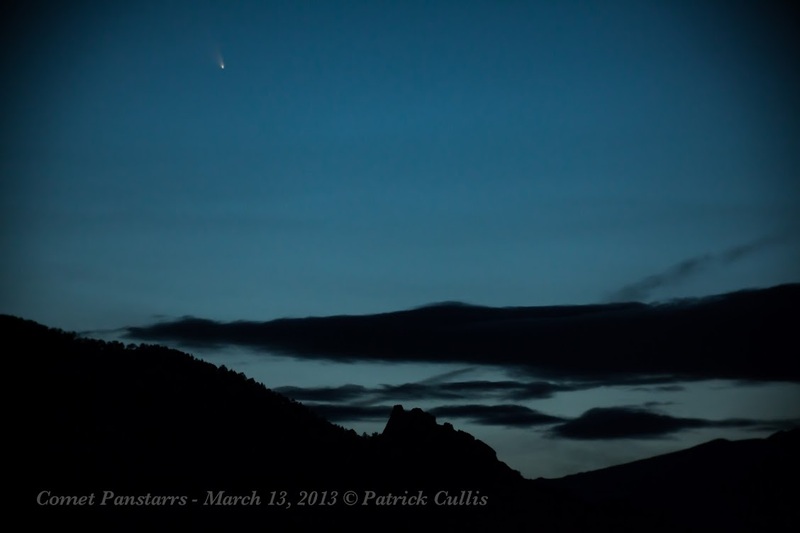 Comet PanSTARRS C/2011 L4 Setting with Crescent Moon near Balanced Rock, Arches National Park, Utah. Last edited by Matt on Wed Mar 13, 2013 8:11 am, edited 1 time in total. 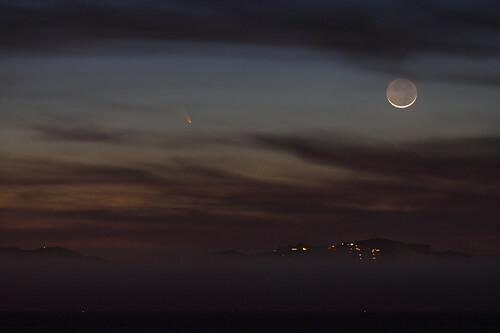 Comet C/2011 L4 (PANSTARRS) and a thin crescent moon in the evening sky above Sausalito, California on March 12, 2013. I had been trying to spot the comet for the last couple of days, but tonight was the first time the western sky was not covered by clouds. 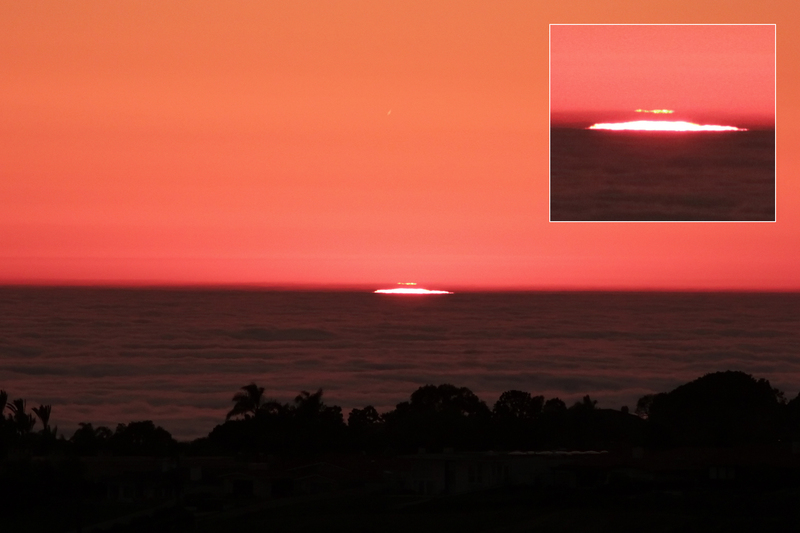 About an hour after sunset I could briefly see a small fuzzy spot with the naked eye. Stacking of four two-second exposures made the comet's tail visible. 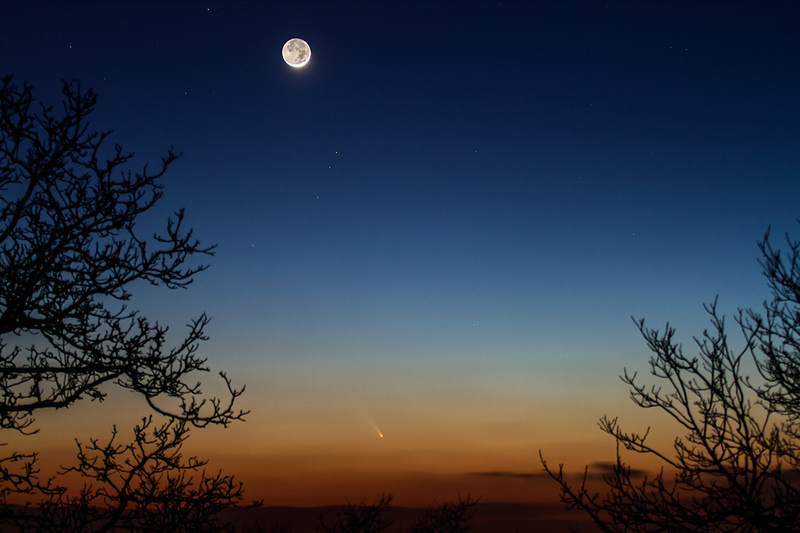 On March 12 we observed PanStarrs in Neumünster / Germany together with the moon. 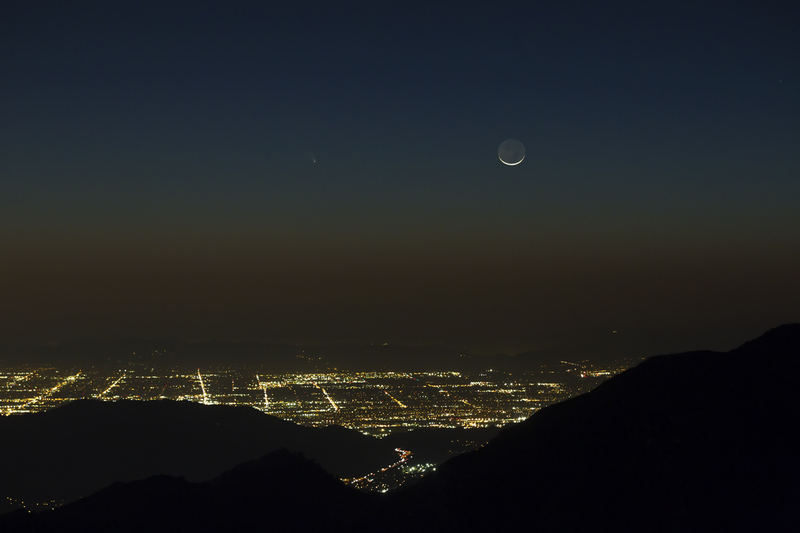 We had a nice appearance of PanSTARRS over southern California last night. Several people set up at Del Cerro Park and enjoyed some nice views. Last edited by owlice on Thu Mar 14, 2013 10:00 am, edited 3 times in total. 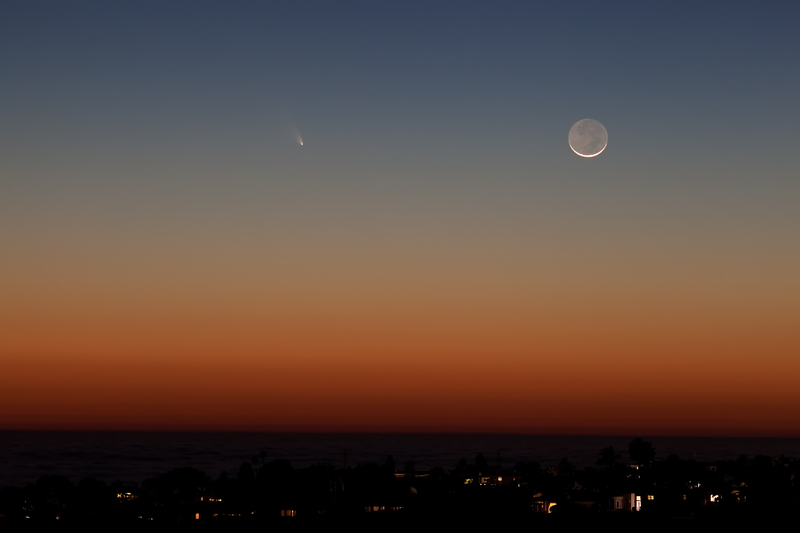 Here is my latest video, with main subject the comet PanStarrs. Last night we did an open public observing session to take pictures and see the comet from Likabetus mount in Athens (Greece). 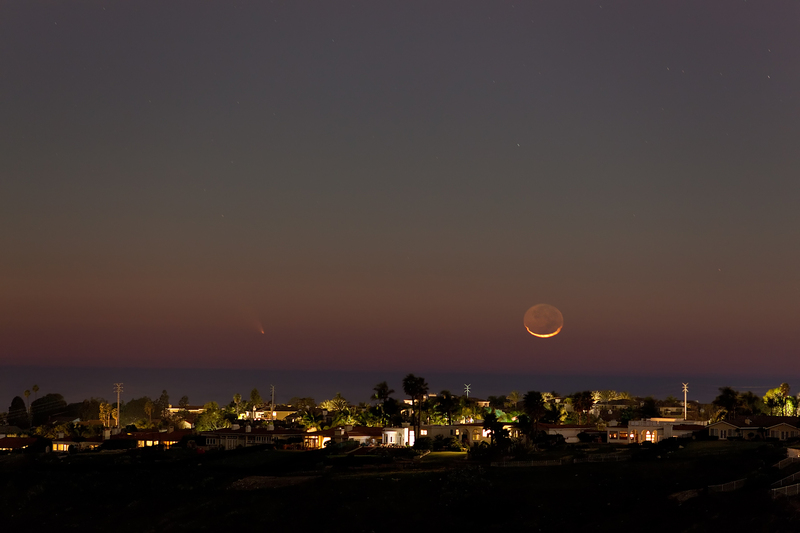 Comet PanSTARRS by the new moon. 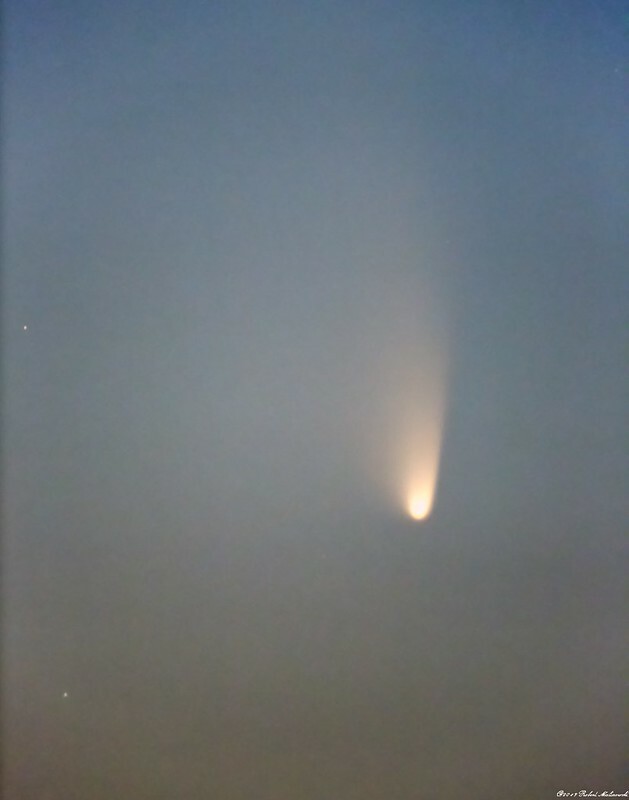 Seen from Baton Rouge, LA. Last edited by owlice on Thu Mar 14, 2013 10:02 am, edited 2 times in total. Not quite a comet shot, but a shot of a guy setting up his telescope by the Mississippi river as the sun set getting ready for the comet! Last edited by owlice on Thu Mar 14, 2013 10:04 am, edited 2 times in total. 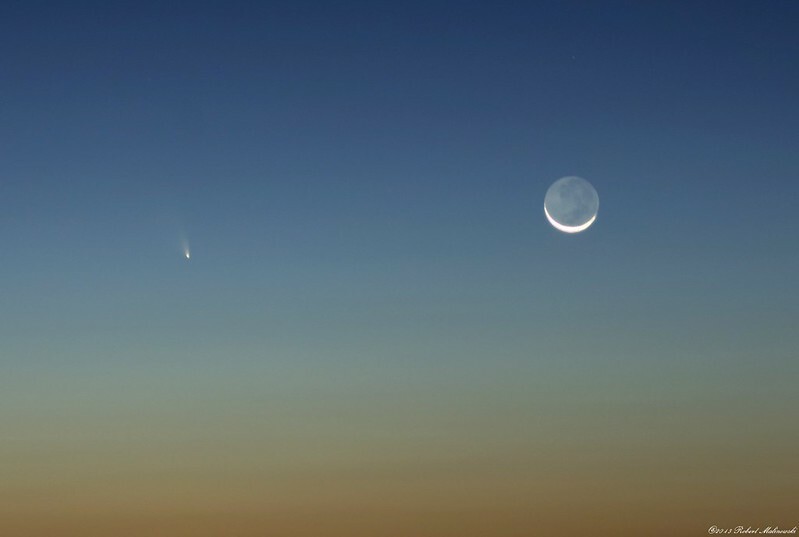 Comet PanSTARRS and the crescent Moon setting over the Texas high plains on 3/12. The day had been windy, so the last embers of the sunset turned a rusty brown. Nikon D5100, Nikon 70-210 at 190mm, f/4, 8 seconds, ISO 800. 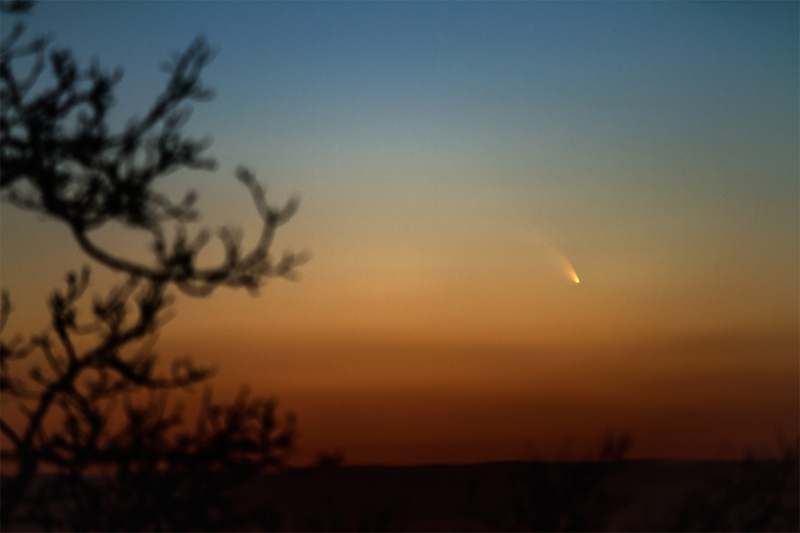 Even though there were some serious clouds over Boulder at sunset I still decided to have a go at Comet Panstarrs. 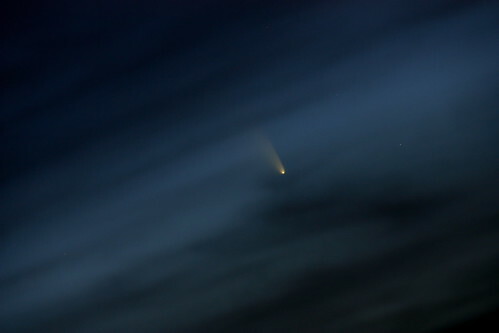 Luckily two layers of clouds set up and the comet streaked right through the clear spot in the middle. At the bottom of the picture is the shark-fin tip of the 1st Flatiron. I'm pretty happy with the pictures but the comet was even better through the binoculars! Hopefully I get a few more chances over the next couple of days to photograph it. Last edited by pcully on Thu Mar 14, 2013 3:22 pm, edited 1 time in total. 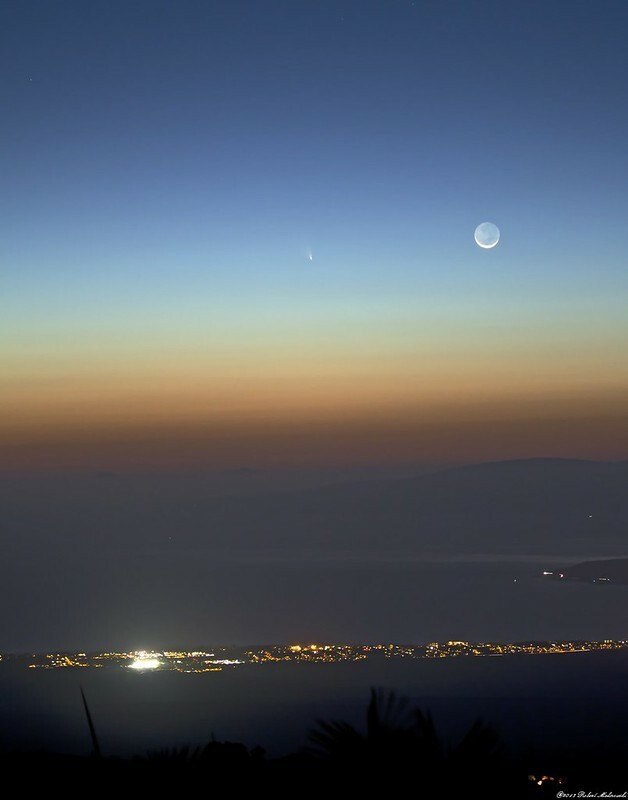 Comet PanSTARRS and the Moon setting over Albuquerque, NM March 12, 2013. My first post. I read instructions on how to display a linked image but obviously failed. Sorry. The link does seem to work. Last edited by bystander on Thu Mar 14, 2013 9:50 am, edited 1 time in total. 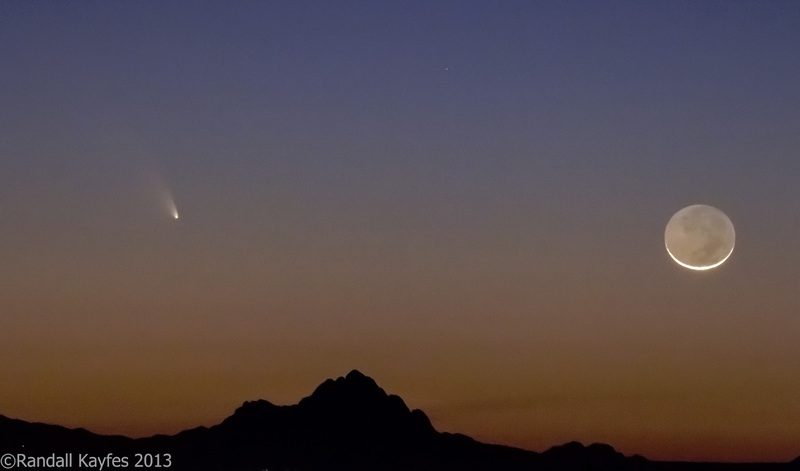 Comet C/2012 L4 Panstarrs from Vercingetorix Oppidum of Alesia. Last edited by bystander on Thu Mar 14, 2013 6:21 pm, edited 1 time in total.